Thank you for your interest in recruiting from the College of Engineering at Iowa State University! Engineering Career Services helps employers connect with thousands of current students and alumni who are prepared to make a difference in the world through creative, innovative engineering solutions. 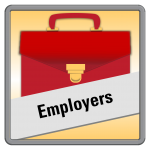 With the exception of career fairs, all employer services are provide free of charge. More information can be found by following the links on this page, but please don’t hesitate to contact us if you have any questions. POST JOBS PARTICIPATE IN CAREER FAIRS INTERVIEW ON CAMPUS HOLD AN INFO SESSION HIRE ANINTERN Connect with Engineering Talent(Click on an area of the image for more info) Two of the nation’s largest career fairs held annually! Approximately 1,000student and alumni CyHire logins each day! Free and convenient – improve your recruiting success! A great way to network and increase name recognitionon campus! Complete projects and identify potential for full-time hires! Download our Hiring Iowa State Engineering Students and Alumni Information Sheet for an abbreviated version of the information found on the above linked pages. Additional Ways to Connect with Students: Get involved in student activities and projects to increase name recognition and see emerging engineering talent in action. Partner with ISU: Explore the ways you can build your relationship with Iowa State’s College of Engineering to develop engineers, expand knowledge, improve technologies, and make new discoveries. Engineering Programs Document – This documents provides more in depth information about our departments and their programs. College of Engineering Web Pages and the ISU catalog. View recruiting information for the past year, including: Career Fairs, On-Campus Interviewing, Experiential Education, and much more!